Badge crafted by the Powder Kegs, the heretics of the Workshop. The Powder Kegs adoration of complex design and big booms culminated in weapon designs that contrast with those traditionally of the Workshop. The late Powder Kegs, bless their souls, had a motto: "If a weapon ain't got kick, it just ain't worth it.'" 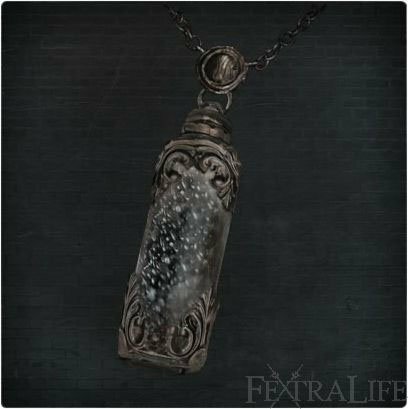 Powder Keg Hunter Badge is a Key Item in Bloodborne. Stake Driver, Rifle Spear, Oil Urn and Rope Molotov Cocktail unlocked for purchase at the Bath Messenger shop in Hunter's Dream. Dropped by Djura when killed. Given by a friendly Djura if the player talks to him and chooses to "Spare the beasts of Old Yharnam". After entering the Darkbeast Paarl boss room for the first time in Hypogean Gaol and gaining 1 Insight, approach Djura from the back of Old Yharnam (by awakening at Church of the Good Chalice or Graveyard of the Beast) without being spotted by him. If Djura falls off the roof, the Powder Keg Hunter Badge may become unattainable from where he falls. Fortunately, the item will reappear by his Gatling gun if the player reloads the area by exiting the game, dying, or visiting the Hunter's Dream. Djura must also be killed to be able to buy his Ashen Hunter Set. Obtaining the Badge will only unlock weapons. This thing bugged away from me after ng+. At least it must have cuz u could buy ashen hunter set. Now i wanted to get 100% tropys and i couldnt buy rifle spear etc.